Development and analysis of a germline BAC resource for the sea lamprey, a vertebrate that undergoes substantial chromatin diminution. Title Development and analysis of a germline BAC resource for the sea lamprey, a vertebrate that undergoes substantial chromatin diminution. Over the last several years, the sea lamprey (Petromyzon marinus) has grown substantially as a model for understanding the evolutionary fundaments and capacity of vertebrate developmental and genome biology. Recent work on the lamprey genome has resulted in a preliminary assembly of the lamprey genome and led to the realization that nearly all somatic cell lineages undergo extensive programmed rearrangements. Here we describe the development of a bacterial artificial chromosome (BAC) resource for lamprey germline DNA and use sequence information from this resource to probe the subchromosomal structure of the lamprey genome. The arrayed germline BAC library represents approximately 10x coverage of the lamprey genome. Analyses of BAC-end sequences reveal that the lamprey genome possesses a high content of repetitive sequences (relative to human), which show strong clustering at the subchromosomal level. This pattern is not unexpected given that the sea lamprey genome is dispersed across a large number of chromosomes (n approximately 99) and suggests a low-copy DNA targeting strategy for efficiently generating informative paired-BAC-end linkages from highly repetitive genomes. 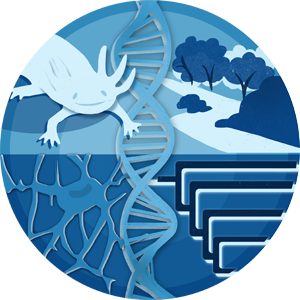 This library therefore represents a new and biologically informed resource for understanding the structure of the lamprey genome and the biology of programmed genome rearrangement.